Having the right shoes to play the game of soccer is the first step in achieving the best result in the game. It is also very important to know the best indoor soccer shoes to wear when playing the game indoor. This article will help you answer most of your questions on the types of shoes to choose and the one that best suits you. The position you play on the field is also a key factor in choosing the right shoe for yourself. This will make you not wear a show that is meant for outdoor games in an indoor match because it will affect your grip and also will influence your performance. For instance, a goalkeeper is expected to wear an indoor shoe that has insoles because they will be going to the ground to make saves and they will definitely be needing lot of support. A good defender in an indoor soccer game needs a shoe with durability and support while an attacking player need a shoe that is light on the feet. Knowing all these information help in making the right decision when buying the best indoor shoes for games. Generally, every of the best indoor soccer shoes should be light weight with flat rubber soles. Knowing the indoor court a match will be played also influence the decision when buy a shoe. The type of materials used to make the shoe is also a key factor to consider when buying the shoe. The best indoor shoes are the ones made with air-holes which allows the feet to be fresh during games. This is very important when playing for long and the need air which allows better performance. When picking a shoe, shoes that will be too tight to the feet is not advised as it may cause swollen toes after long time wearing them so its best one pick shoes that are firm to the feet but also free to an extent. After knowing the things to watch out for when buying, it is time to choose from the best indoor soccer shoes. The available cash with a buyer determines how he spends. 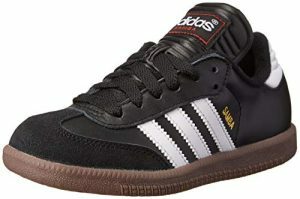 Comfort and elegance are part of the factors that favours Adidas Performance Men’s Samba Classic Indoor Soccer Shoe. It is a shoe that can be worn either on the field of play or casually which makes it a two in one shoe. It is a shoe that is round leather for most of its part. The only part that is made of foam is the tongue of the shoe. The shoe is design in such a way that has the toe box have thick suede that help with grip and increase durability. One key feature of this shoe is the wave pattern design at the bottom of the heel which serve as a form of grip to the foot. It’s added advantage is that it can be worn without socks. This is possible because of the insole that has little pad in it and it is made of light weighted die-cut EVA form but the insole is not removable. Many are advised to go for this shoe for its afford-ability. To add to this, it has laces which give extra room for air to be able to enter the feet. Its wide range of size for different leg shape makes it a shoe for everyone regardless of their identity. It however need to be maintained very well as the suede get dirty easily and need to be washed always. While still new, the leather upper part is often hard on the leg but with continue usage, it softens. There are different people with different requirement when they are making purchases. One of the things people watch out for is that will this shoe be compatible with my type of feet? This question must be answered sincerely before making any purchase. If the answer to this question is yes, then the point now is what exactly is the type of shoe that one’s feet fit in. If you are one with wide feet, then there is a special shoe design to fit your exact type of leg. 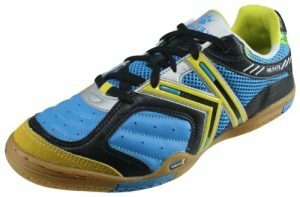 This type of shoe is called the Kelme Star 360 Mens Shoes. The satisfaction this type of shoe brings is in its varities of colour and the comfort and grip that comes with it is second to none. This is a special shoe with special qualities. The design of the shoe is also very unique. The sole is made up of top notch Michelin rubber with various patterns which is very good for traction and grip. It is also a special shoe because its sole is lightweight, flexible and comfortable. There is synthetic leather and suede insert in front of the shoe which is made up of Nappa Leather. The back is also made of synthetic leather and mesh which give it overall balance. Structurally, the shoe is fit to last for a long time and the performance of the user will not be hinder with time. This is an added advantage for many that will be engaging in long time soccer games at a stretch, for example, four hours training or more. It also have mesh lining inside the tongue which is padded. The reason for the mesh lining is to improve ventilation. Its major advantage is its light weight and larger cut that makes it fit perfectly. The only major concern it has is the mesh lining that can make move and lose grip. Apart from this, Kelme Star 360 Men’s Shoes is one of the best shoe money can buy. 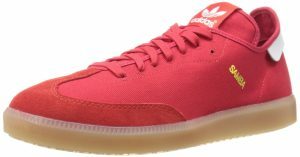 The word durability can has found a synonyms in Adidas Men’s Samba Millennium Indoor Soccer Shoe as the shoe is the perfect soccer shoe o describe durability. It is one that guaranty durability at a very affordable price. It is made up of mixture of full grain leather, suede and rubber. The front part of the shoe is the part made of suede that provide the structural stability while the upper part is made of quality leather which support with the strength of the leather. The leather tongue is covered with a form lining. This lining help prevent the stoppage of blood flow in the foot. The flatness of the shoe help improve the support and grip needed for comfort. Its sole like many other shoe is made of gum rubber which is a pattern designed outsole all for improved grip. The inside sole is made up of Die-Cut EVA sole which offers light-weight comfort while the mid-sole consist of pre-molded EVA better cushioning of the feet. One of its key advantage is its support to flat fee which provide excellent grip on indoor surfaces. Add that to affordability and you have one of the best soccer shoe money should buy. Its lack of big sizes which makes most of the shoe tight to the feet might be what the manufacturer could look into in future. Indoor soccer is not meant for adults alone as kids are also a key part of it. In fact kids involve in more indoor soccer games. This is because before they go professional, they will have experience enough of indoor soccer games. This is why they also deserve to get the best indoor soccer shoes. 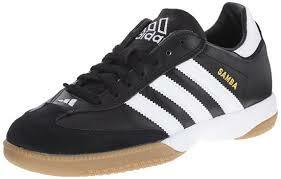 There is a product that will best suit them and it is called the Adidas Samba Classic Leather Soccer Shoe. After this has been identified as the best shoe for kids, some more qualities has to be checked to prove that this is the best for kids. Three things set it apart as the shoe to buy; it is economical to the average buyer, comfortable to use and also one of the most durable you can see around. The design of the shoe is similar to many that has earlier been discussed but with little addition and adjustment. The upper part of the shoe is made up of both suede and leather. This is an added advantage as it provides toughness to the longevity the shoe will guaranty. The lace is design in such a way to provide needed by kids to free them while running which also add to the support the extended leather provide for the ankle. Its light weight is derived from the Die-cut EVA insole which also makes it very comfortable. The friction at the bottom of the sole is derived from the rubber sole needed for indoor surfaces. One advantage the shoe has is that it is very comfortable for all type of children and it is also a good fit for women with small and sensitive feet. All these are extras added to its affordability. The only issue seen with it is some user sees it as too cheap due to the type of leather used for it. There are some sport men that elegance is their first criteria when making purchase, there is an indoor soccer shoe that suits them perfectly. 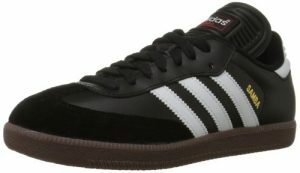 It is called the Adidas Men’s Samba MC Soccer-Style Sneaker. It is choice that feat the aesthetics users that love top notch quality money can buy. The shoe has a trendy cut and vibrant colors that makes it stand out amongst it pairs. Its design is however similar to many other top quality shoes. It has a synthetic suede and fabric on the upper and front. Comfort is derived in the foot through the long tongue with foam inside. The foam inside the tongue also help ease flow of blood. It has a lace that occupy a long area providing extra grip to the feet. It has a rubber sole also which help with friction as well. The design of the heel is somewhat a very unique one that is extra-large to give equal support to heel and ankle. The major problem the shoe has is that it’s not suitable for people with wider feet. After knowing the top five best indoor soccer shoes, it is also important to have some other information on the shoe before buying. One is the type of shoes. There are six types of shoe common around and they are group as soft ground cleats, indoor soccer shoes, turf shoes, artificial grass cleats, firm ground cleats and futsal soccer shoes. So when buying, be sure of which type you are buying. In this case, indoor soccer shoe is the type we will be needing. The type that is best for one is determine by the court that will be played on. Some soccer association however state the type of shoes they want for their tournament and it is important to adhere strictly with the rules. Some also request for shoes without lace. This is possible and in fact available but its best suited for kids and slip on Velcro. Due to the fact that soccer is a game that can be played under different weather condition, it is good to be prepared for it. In days where it rain, the type of cleat to be worn has to be one that will be suitable for the weather. So in choosing this, one factor to look for is that how long does it take to dry up. When this can be identified, it is easier to know what type to go for. If well observed, all the shoes that have been reviewed so far have so many similarities in them with one or two features changing across the line. Two key factors should be watched out for, the stud and the material used to make shoe. This takes us back to the point made earlier about shoe for different weather. So looking out for the material used in manufacturing them can help and go a long way. For instance there are stadiums that are artificial grass, they have specially made cleats for them same as turfs and soft grounds. When purchase are made for these shoes, one thing the buyer will attest to is that with each buy and more information like this, a better and informed decision is made every time a new purchase is to be made.